On the Solemnity of Saint Joseph: Why Live In Fear With Saint Joseph So Near? So many people live their entire lives in fear. Those steeped in the naturalistic falsehoods of the “left” live in fear that those who are steeped in the naturalistic falsehoods of the “right” will acquire and retain governmental power, putting out all manner of “alerts” prior to elections and during the presidential administrations of their hated foes. Such was the case during the administration of former President George Walker Bush as naturalists of the “left” denounced their fellow naturalist with great fury, disregarding the fact that they were of one mind with him in believing that is not necessary for every man and nation on the face of this earth to subordinate themselves at all times to the Deposit of Faith that Our Blessed Lord and Saviour Jesus Christ has entrusted exclusively to the Catholic Church in all that pertains to the good of souls. Those steeped in the naturalistic falsehoods of the “right” live in fear that those who are steeped in the naturalistic falsehoods of the “left” will acquire and retain governmental power, putting out all manner of “alerts” prior to elections and during the presidential administrations of their hated foes. Such was the case during the administration of former President William Jefferson Blythe Clinton. Such is the case at present during the administration of Caesar Barackus Obamus Ignoramus, who was depicted six years ago now in a sacrilegious “artistic” display in the Borough of Manhattan in the City of New York, New York. Clinton was denounced with great fury in the 1990s by naturalists of the “right.” Obama was denounced with great fury now by these same naturalists. All of these denunciations have disregarded the fact that the naturalists of the “right” have been of one mind with the Clintons and Obama in believing that is not necessary for every man and nation on the face of this earth to subordinate themselves at all times to the Deposit of Faith that Our Blessed Lord and Saviour Jesus Christ has entrusted exclusively to the Catholic Church in all that pertains to the good of souls. Catholics, I am afraid (pun intended), all across and up and down the ecclesiastical divide, live in fear as well. Making the fatal mistake of watching the idiot box that is television and having their peace disturbed unnecessarily by what passes for “news,” going into histrionic fits over things that are “done deals” and are being visited upon us as a means to chastise the country for its many sins against the Sovereign Rights of Christ the King. There is no naturalistic, inter-denominational or nondenominational way to put “Humpty Dumpty” back together again. We are witnessing the logical and inevitable degeneration that must take place in any regime founded on the false, naturalistic, anti-Incarnational, religiously indifferent and semi-Pelagian principles of Modernity. There is one and only one means to stop this process of degeneration: Catholicism. There is no short-cut. All of the issues that present themselves for immediate, if not manic, attention are the result of a world that has been disordered not only by Original Sin and our own Actual Sins but by the logical consequences of the overthrow of the Social Reign of Christ the King wrought by the Protestant Revolt and institutionalized by a veritable plethora of naturalistic ideologies and “philosophies” that are of the essence of Judeo-Masonry. It is most telling that less than 0.5% of respondents in a recenbt Gallup Poll said that abortion was the most important issue facing the country (see Most Important Issues Facing the Nation). Less than half of a percentage point!. As I noted in Figures of Antichrist one hundred two months ago now, it’s all about the money. It hasn’t changed in the year 2017, has it? The daily assassination of children by chemical and surgical means? Just too bad. Less than one-half of a single percentage point in that recent Gallup survey where one in five respondents (twenty percent) were Catholic said that abortion was the most important issue facing the nation. The gruesome details that emerged several ago from the convicted baby-butcher Kermit Gosnell’s trial in the City of Philadelphia, Pennsylvania? It’s no wonder that only two percent of people in the United States of America understand that a nation that sheds the blood of the innocent under cover of the civil law is not “under God” and will never realize any long term material prosperity. One-half of one percent. That’s hardly a foundation for “electoral” success or flexing “muscle” to influence the course of public policy debates. The actual reality in which we live should teach us that each and every single naturalistic or inter-denominational effort to “turn back” the tide of evil that has been let loose, proximately speaking, by the Protestant Revolt and its diabolical aftermath, does nothing whatsoever to “influence” the public-at-large. The universe of “conservative” websites and organizations consists of people who are talking to themselves about naturalistic ideas that are the proximate source of the problems we face, not any part of a solution that can come only from the conversion of this nation–and everyone in it–to Catholic Faith, outside of which there is no salvation and without which there can be no true social order. Even the “conservative” “renaissance” at the polls in 2010, 2014 and 2016 that was founded in a desire to roll back the size and scope of intrusive, coercive power of the Federal government of the United States of America has failed for a variety of reasons, not the least being the disputes between “Tea Party” partisans and establishment Republicans, who care only about elections and not about policy. The principal reason that the so-called “conservative” “renaissance” has failed at the national level and will continue to fail that is naturalists of the “right” do not take cognizance of the fact that statism must triumph in a world where the Catholic Church is not able to exercise the Social Reign of Christ the King and hence a world where leaders do not pursue the common temporal good in light of man’s Last End, the possession of the glory of the Beatific Vision of God the Father, God the Son, and God the Holy Ghost for all eternity in Heaven. There is no need to be in fear about the realities facing us. Persecution is good! As to what We have called the goods of the soul, which consist chiefly in the practice of the true religion and in the unswerving observance of the Christian precepts, We see them daily losing esteem among men, either by reason of forgetfulness or disregard, in such wise that all that is gained for the well-being of the body seems to be lost for that of the soul. A striking proof of the lessening and weakening of the Christian faith is seen in the insults too often done to the Catholic Church, openly and publicly — insults, indeed, which an age cherishing religion would not have tolerated. For these reasons, an incredible multitude of men is in danger of not achieving salvation; and even nations and empires themselves cannot long remain unharmed, since, when Christian institutions and morality decline, the main foundation of human society goes together with them. Force alone will remain to preserve public tranquillity and order. But force is very feeble when the bulwark of religion has been removed, and, being more apt to beget slavery than obedience, it bears within itself the germs of ever-increasing troubles. The present century has encountered memorable disasters, and it is not certain that some equally terrible are not impending. The very times in which we live are warning us to seek remedies there where alone they are to be found — namely, by re-establishing in the family circle and throughout the whole range of society the doctrines and practices of the Christian religion. In this lies the sole means of freeing us from the ills now weighing us down, of forestalling the dangers now threatening the world. For the accomplishment of this end, venerable brethren, We must bring to bear all the activity and diligence that lie within Our power. Although we have already, under other circumstances, and whenever occasion required, treated of these matters, We deem it expedient in this letter to define more in detail the duties of the Catholics, inasmuch as these would, if strictly observed, wonderfully contribute to the good of the commonwealth. We have fallen upon times when a violent and well-nigh daily battle is being fought about matters of highest moment, a battle in which it is hard not to be sometimes deceived, not to go astray and, for many, not to lose heart. It behooves us, venerable brethren, to warn, instruct, and exhort each of the faithful with an earnestness befitting the occasion: that none may abandon the way of truth. It cannot be doubted that duties more numerous and of greater moment devolve on Catholics than upon such as are either not sufficiently enlightened in relation to the Catholic faith, or who are entirely unacquainted with its doctrines. Considering that forthwith upon salvation being brought out for mankind, Jesus Christ laid upon His Apostles the injunction to “preach the Gospel to every creature,” He imposed, it is evident, upon all men the duty of learning thoroughly and believing what they were taught. This duty is intimately bound up with the gaining of eternal salvation: “He that believeth and is baptized shall be saved; but he that believeth not, shall be condemned.” But the man who has embraced the Christian faith, as in duty bound, is by that very fact a subject of the Church as one of the children born of her, and becomes a member of that greatest and holiest body, which it is the special charge of the Roman Pontiff to rule with supreme power, under its invisible head, Jesus Christ. Now, if the natural law enjoins us to love devotedly and to defend the country in which we had birth, and in which we were brought up, so that every good citizen hesitates not to face death for his native land, very much more is it the urgent duty of Christians to be ever quickened by like feelings toward the Church. For the Church is the holy City of the living God, born of God Himself, and by Him built up and established. Upon this earth, indeed, she accomplishes her pilgrimage, but by instructing and guiding men she summons them to eternal happiness. We are bound, then, to love dearly the country whence we have received the means of enjoyment this mortal life affords, but we have a much more urgent obligation to love, with ardent love, the Church to which we owe the life of the soul, a life that will endure forever. For fitting it is to prefer the good of the soul to the well-being of the body, inasmuch as duties toward God are of a far more hallowed character than those toward men. Moreover, if we would judge aright, the supernatural love for the Church and the natural love of our own country proceed from the same eternal principle, since God Himself is their Author and originating Cause. Consequently, it follows that between the duties they respectively enjoin, neither can come into collision with the other. We can, certainly, and should love ourselves, bear ourselves kindly toward our fellow men, nourish affection for the State and the governing powers; but at the same time we can and must cherish toward the Church a feeling of filial piety, and love God with the deepest love of which we are capable. The order of precedence of these duties is, however, at times, either under stress of public calamities, or through the perverse will of men, inverted. For, instances occur where the State seems to require from men as subjects one thing, and religion, from men as Christians, quite another; and this in reality without any other ground, than that the rulers of the State either hold the sacred power of the Church of no account, or endeavor to subject it to their own will. Hence arises a conflict, and an occasion, through such conflict, of virtue being put to the proof. The two powers are confronted and urge their behests in a contrary sense; to obey both is wholly impossible. No man can serve two masters, for to please the one amounts to contemning the other. As to which should be preferred no one ought to balance for an instant. It is a high crime indeed to withdraw allegiance from God in order to please men, an act of consummate wickedness to break the laws of Jesus Christ, in order to yield obedience to earthly rulers, or, under pretext of keeping the civil law, to ignore the rights of the Church; “we ought to obey God rather than men.” This answer, which of old Peter and the other Apostles were used to give the civil authorities who enjoined unrighteous things, we must, in like circumstances, give always and without hesitation. No better citizen is there, whether in time of peace or war, than the Christian who is mindful of his duty; but such a one should be ready to suffer all things, even death itself, rather than abandon the cause of God or of the Church. Hence, they who blame, and call by the name of sedition, this steadfastness of attitude in the choice of duty have not rightly apprehended the force and nature of true law. We are speaking of matters widely known, and which We have before now more than once fully explained. Law is of its very essence a mandate of right reason, proclaimed by a properly constituted authority, for the common good. But true and legitimate authority is void of sanction, unless it proceed from God, the supreme Ruler and Lord of all. The Almighty alone can commit power to a man over his fellow men; nor may that be accounted as right reason which is in disaccord with truth and with divine reason; nor that held to be true good which is repugnant to the supreme and unchangeable good, or that wrests aside and draws away the wills of men from the charity of God. This a time of martyrdom, both dry and wet. Rejoice that is so. Rejoice! Catholics in the time of Emperor Diocletian, under whom Saints Soter and Caius, whose feast is commemorated today, were not petitioning their Roman senators to stop the persecutions. They knew that such an effort was futile, that Diocletian and his minions had the physical means at their disposal to do whatever it was they wanted to do. Diocletian and his minions were not going to be stopped by means petition drives sponsored by a small number of Roman citizens. Could you imagine the following petition: “STOP DIOCLETIAN NOW! WRITE YOUR SENATOR. STOP THE MADNESS. HE IS KILLING US. ROME’S FOUNDING FATHERS, ROMULUS AND REMUS, WOULD BE APPALLED AT THIS.” Catholics knew that the blood of the martyrs was the seed of the Church. They weren’t having “tea parties” to stop the persecutions. Why do we live in such histrionic fear? Catholics in the time of King Henry VIII and Elizabeth I were not petitioning the Parliament to stop the persecutions following the Acts of Supremacy in 1534 and in 1559. They knew that those respective monarchs were going to act as they desired. Those Catholics who remained faithful to the Catholic Church knew that they were not going to get anywhere in the legal and political structures under the absolute control of these monarchs. These Catholics, who saw most of their co-religionists accept the new religion of Anglicanism and come to hate Catholicism and everything associated with it within thirty to forty years of Henry’s break with Rome, knew that martyrdom was going to be their path to Heaven should it befall them. While they circulated pamphlets in support of the Faith, they did not waste their time by trying to convince political officials who they knew were going to protect themselves by doing the bidding of the king or the queen. Yes, while we must note the efforts of the statists at present and denounce things contrary to the binding precepts of the Divine Positive Law and the Natural Law, we must also recognize the fact that the effects of Modernity and Modernism have made measures contrary to the good of souls acceptable to large numbers of citizens. A new era of martyrdom is upon us. Rejoice! We are not going “turn back the tide” by use of the means of the Protestant Revolt (protests). We are going to win new souls for Christ the King and His true Church, which is now in the catacombs, by doing our work as apostles to pray and to work for the conversion of non-Catholics. This time of martyrdom gives those of us us who have been lukewarm and worldly and half-hearted in our interior lives an opportunity to make reparation for our sins by means of bearing a visible, tangible witness to the Catholic Faith–not to any naturalistic “creed”–as the one and only foundation of personal and social order. Rejoice, my friends, as God has known–indeed, He has willed it so–from all eternity that we would be alive in these troubling times, which means that the graces won for us by the shedding of the Most Precious Blood of the Divine Redeemer, Our Blessed Lord and Saviour Jesus Christ, on the wood of the Holy Cross and that flow into our hearts and souls through the loving hands of Our Lady, she who is the Mediatrix of All Graces, are sufficient for the difficulties that we face, both personally and socially. The graces won for us by Our Divine Redeemer on the wood of the Holy Cross and that flow into our hearts and souls through the loving hands of Our Lady are also sufficient for us to deal with the ecclesiastical crisis we face at this time as the Church Militant on earth is going through her Holy Saturday, as one very perceptive reader explained yesterday in a note to me. There is no need to live in fear. Christ the King will emerge victorious following the Triumph of the Immaculate Heart of His Most Blessed Mother. The apostasies and sacrileges and blasphemies and other outrages being visited upon us by the the conciliar revolutionaries, who are in physical custody of our church buildings and schools, will be swept away. There is no need to live in fear, no need to “petition” men who have expelled themselves from the Catholic Church by virtue of subscribing to–and professing most publicly–propositions that have been condemned by her most solemnly and consistently without an deviation at all. Why live in fear with Saint Joseph is so near now as ever before? We have the assurance that Saint Joseph, the Patron of the Universal Church and the Protector of the Faithful whose solemnity in Paschaltide, a feast that originated with Pope Pius IX in 1847 as the Patronage of Saint Joseph before being given its current name, the Solemnity of Saint Joseph, by Pope Saint Pius X in 1911 and positioned in 1913 on the Wednesday following the Second Sunday after Easter, is very close to us in our sufferings and difficulties and trials today. Saint Joseph, the just and silent man of the House of David, suffered in his holy life. He suffered without fear. He trusted in the Providence of God, taking unto himself the care of God’s very Mother, the Singular Vessel of Devotion through which would be conceived and pass into the world his, Saint Joseph’s, foster-Son, Whom he loved with a tender devotion and perfection as though He had been his own flesh and blood. He suffered intense sorrows of his soul during his lifetime. Saint Joseph suffered pain at the lowly poverty of the birthplace of his foster-Son. Saint Joseph suffered pain at the Circumcision as he watched the shedding of the first droplets of his foster-Son’s Most Precious Blood. Saint Joseph listened with patient concern to the Prophecy of Simeon that a Sword of Sorrow would pierce the Immaculate Heart of Most Chaste Spouse. Saint Joseph suffered sorrow during the difficult journey back from Egypt. Saint Joseph’s good heart suffered ruing the loss of his foster-Son for three day. Oh yes, Saint Joseph suffered. He suffered, however, without fear, without panic, without histrionics, without even uttering a word that is recorded in Sacred Scripture. Saint Joseph had sorrows. He had concerns. True enough. However, Saint Joseph trusted in God entirely. So we must we, especially since his Divine foster-Son has given him to us to be the Patron of the Universal Church and the Protector of the Faithful. Saint Joseph outlived the wretched Herod the Great, who sought the life of the Christ-Child. Saint Joseph will help us outlive, at least spiritually, the Herods of the present day who populate the halls of government and the institutions of the counterfeit church of conciliarism. Saint Joseph is near. Very near. Why live in fear? The only thing that matters in each of our lives is dying in a state of Sanctifying Grace with Perfect Contrition for our sins. The devil wants us live in fear and in a constant state of panic about this or that piece of legislation or this or that manufactured virus that is spread so as to put us into a panic and to increase the size and scope of governmental power over our lives. Saint Joseph, the terror of demons, wants to live in peace now as members of his Divine Son’s Catholic Church so that he, the Patron of Departing Souls, can be better able to assist us at the hour of our deaths as we invoke his fatherly protection after that of His Most Chaste Spouse, Our Lady. Jesus, Mary, and Joseph, I love you. Save souls! Jesus, Mary, and Joseph, pray for us now and in death’s agony! Saint Joseph provided spiritual and temporal security and comfort to the Mother of God and his foster-Son, Who he was told by Saint Gabriel the Archangel had been conceived by the power of God the Holy Ghost. He will provide that same spiritual and temporal security to us, will he not? Indeed, hasn’t he done so throughout the course of our lives? Saint Joseph is helping us in this era of apostasy and betrayal. The foster-father of Our Divine Redeemer, Who offered up His life on the wood of the Holy Cross in atonement for our sins, intercedes for our spiritual fathers on earth, our true bishops and our true priests who make no concessions to the counterfeit church of conciliarism or to its false shepherds who blaspheme his foster-Son by falling down, at least figuratively, if not literally, in front of the same false idols that fell in front of his foster-Son in Egypt. Why live fear with Saint Joseph as near to us as he was to Our Lady and Our Lord on earth. He is even closer to them now in Heaven? When any special favours are conferred upon a reasonable being, it is the common rule that whenever the grace of God electeth such and such an one for such and such a grace, or for such and such an high post of duty, the person so elected receiveth all the gifts of grace which be needful for him in that state of life whereunto he is called, and receiveth them abundantly. Of this there is an excellent instance in the case of the holy Joseph, the socalled father of our Lord Jesus Christ, and the real husband of her, who is Queen of the world, and Lady of Angels. He had been elected by the Eternal Father to be the faithful nurse and warder of His two chief treasures, that is, His Son, and Joseph's own Wife. This duty Joseph faithfully discharged, and consequently the Lord hath said to him: Well done, thou good and faithful servant enter thou into the joy of thy Lord. Matth. xxv. 21. This man Joseph, if we compare him with the Universal Church of Christ, is he not that elect and chosen one, through whom, and under whom, Christ is orderly and honestly brought into the world? If, then, the Holy Universal Church be under a debt to the Virgin Mother, because it is through her that she hath been made to receive Christ, next to Mary she oweth love and worship to Joseph. Joseph is the key of the (Church of the Saints) which were under the Old Testament, in whose person the noble structure of Patriarchs and Prophets reacheth her completion and realiseth her promises. He is the only one of them who actually enjoyed in full fruition what God had been pleased to promise before to them. It is, therefore, with good reason that we see a type of him in that Patriarch Joseph who stored up corn for the people. But the second Joseph hath a more excellent dignity than the first, seeing that the first only gave to the Egyptians bread for the body, but the second was the watchful guardian for all the elect of that Living Bread Which came down from heaven, of Which whosoever eateth will never die. No, we have nothing whatsoever to fear from the forces of the world, the flesh, and the devil if we rely upon the patronage of the Patron of the Universal Church and the Protector of the Faithful, Saint Joseph. On this glorious feast day, the Solemnity of Saint Joseph in Paschaltide, may we put aside the needless fear and panic caused by the naturalists in the civil realm and the conciliarists in the counterfeit church of conciliarism as we beseech him as follows each morning and each night of our lives. O Saint Joseph, whose protection is so great, so strong, so prompt before the throne of God, I place in thee all my interests and desires. O thou Saint Joseph, do assist me by thy powerful intercession, and obtain for me from thy divine Son all spiritual blessings, through Jesus Christ, Our Lord; so that, having engaged here below thy heavenly power, I may offer my thanksgiving and homage to the most loving of fathers. O Saint Joseph, I never weary contemplating thee, and Jesus asleep in thy arms; I dare not approach while He reposes near thy heart. Press Him in my name and kiss His fine head for me, and ask Him to return the kiss when I draw my dying breath. Saint Joseph, Patron of departing souls, pray for me. Amen! May we pray an extra set of the Joyful Mysteries of Our Lady’s Most Holy Rosary today to honor Saint Joseph, who has been given to us to help us to get home to Heaven by living in the same spirit of confident hope and trust in God’s Holy Will as characterized his entire life on earth. 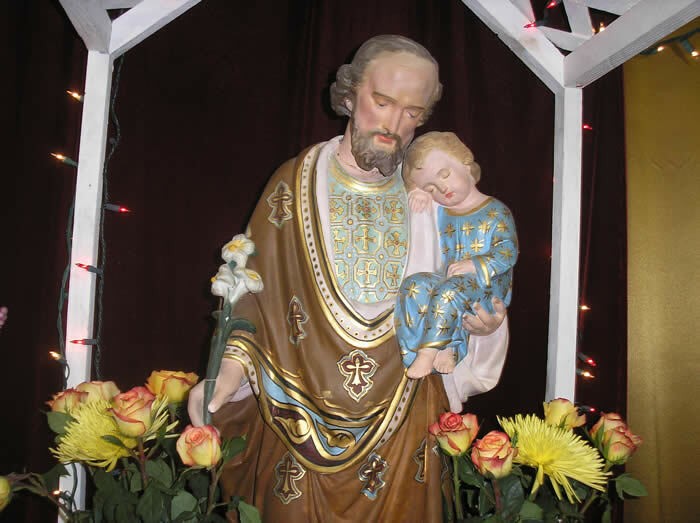 Our reward will be Heavenly if we maintain our steadfast devotion to Saint Joseph, and you might even be amazed at what he does for you temporally if you invoke him with confidence and trust on a daily basis. Shouldn’t we draw nearer to Saint Joseph in this life so that he will be as close as possible to us as we prepare to enter the next? Immaculate Heart of Mary, triumph soon. Saint Joseph, Patron of the Universal Church and Protector of the Faithful, pray for us. Saints Soter and Caius, pray for us. 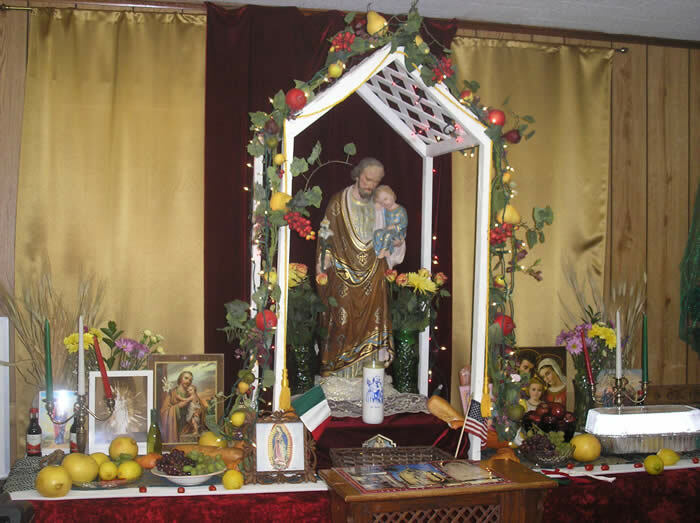 Among the many exercises of piety practiced in honor of St. Joseph, there is one generally known, namely, that of meditating on his Seven Sorrows and Seven Joys. This devotion owes its origin to a celebrated event, never omitted by any historian of the Saint. Two Fathers of the Franciscan order were sailing along the coast of Flanders, when a terrible tempest arose, which sank the vessel, with its three hundred passengers. The two Fathers had sufficient presence of mind to seize hold of a plank, upon which they were tossed to and fro upon the waves, for three days and nights. In their danger and affliction, their whole recourse was to St. Joseph, begging his assistance in their sad condition. The Saint, thus invoked, appeared in the habit of a young man of beautiful features, encouraged them to confide in his assistance, and, as their pilot, conducted them into a safe harbor. They, desirous to know who their benefactor was asked his name, that they might gratefully acknowledge so great a blessing and favor. He told them he was St. Joseph, and advised them daily to recite the Our Father and Hail Mary seven times, in memory of his seven dolors or griefs, and of his seven joys, and then disappeared. 1. St. JOSEPH, Chaste Spouse of the Holy Mother of God, by the SORROW with which thy heart was pierced at the thought of a cruel separation from Mary, and by the deep JOY that thou didst feel when the angel revealed to thee the ineffable mystery of the Incarnation, obtain for us from Jesus and Mary, the grace of surmounting all anxiety. Win for us from the Adorable Heart of Jesus the unspeakable peace of which He is the Eternal Source. 2. St. JOSEPH, Foster-Father of Jesus, by the bitter SORROW which thy heart experienced in seeing the Child Jesus lying in a manger, and by the JOY which thou didst feel in seeing the Wise men recognize and adore Him as their God, obtain by thy prayers that our heart, purified by thy protection, may become a living crib, where the Savior of the world may receive and bless our homage. 3. St. JOSEPH, by the SORROW with which thy heart was pierced at the sight of the Blood which flowed from the Infant Jesus in the Circumcision, and by the JOY that inundated thy soul at thy privilege of imposing the sacred and mysterious Name of Jesus, obtain for us that the merits of this Precious Blood may be applied to our souls, and that the Divine Name of Jesus may be engraved forever in our hearts. 4. St. JOSEPH, by the SORROW when the Lord declared that the soul of Mary would be pierced with a sword of sorrow, and by thy JOY when holy Simeon added that the Divine Infant was to be the resurrection of many, obtain for us the grace to have compassion on the sorrows of Mary, and share in the salvation which Jesus brought to the earth. 5. St. JOSEPH, by thy SORROW when told to fly into Egypt, and by thy JOY in seeing the idols overthrown at the arrival of the living God, grant that no idol of earthly affection may any longer occupy our hearts, but being like thee entirely devoted to the service of Jesus and Mary, we may live and happily die for them alone. 6. St. JOSEPH, by the SORROW of thy heart caused by the fear of the tyrant Archelaus and by the JOY in sharing the company of Jesus and Mary at Nazareth, obtain for us, that disengaged from all fear, we may enjoy the peace of a good conscience and may live in security, in union with Jesus and Mary, experiencing the effect of thy salutary assistance at the hour of our death. 7. St. JOSEPH, by the bitter SORROW with which the loss of the Child Jesus crushed thy heart, and by the holy JOY which inundated thy soul in recovering thy Treasure on entering the Temple, we supplicate thee not to permit us to lose our Saviour Jesus by sin. Yet, should this misfortune befall us, grant that we may share thy eagerness in seeking Him, and obtain for us the grace to find Him again, ready to show us His great mercy, especially at the hour of death; so that we may pass from this life to enjoy His presence in heaven, there to sing with thee His divine mercies forever.